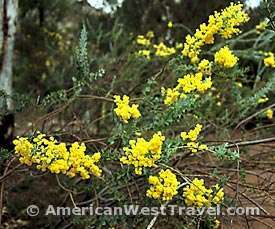 The most beautiful event in the deserts of the American southwest is the spring wildflower season. During a good year, the profusion of color provides a spectacular contrast to the normally arid landscape. To get the best displays there must be heavy rains the previous autumn. This happens perhaps once every seven years. In October 2000, southern Arizona received heavy and persistent rains with spectacular results. Our current fall and winter season (2012-3) has been moderate, and we have observed some fine displays. One of the most enjoyable aspects of wildflower season is visiting the various parks and open areas around Phoenix and Tucson in search of the most beautiful displays. 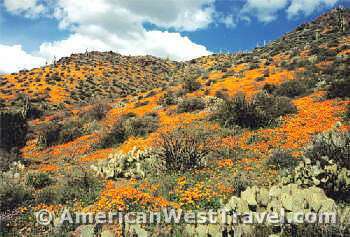 Rainfall distribution is rarely even in the desert so nearby areas may or may not have similar wildflower displays. The season usually lasts from the middle of February until early April. In April, the flowering season for cacti begins with many beautiful displays possible. Below are some excellent places to look for wildflowers. All the parks have fine trails, and most have interesting mountain scenery. National Parks and Forest Service. Saguaro National Park. There is a park unit on both the east and west side of Tucson. In 2001, we found outstanding displays of blue lupine in the west unit. Many other places featured gold poppies. Ina Road or Gates Pass Road, off of Interstate-10 accesses the west unit. Access the east unit off of Freeman Road, south of Broadway. Organ Pipe Cactus National Monument. South of the town of Gila Bend, the monument has frequently offers the finest wildflower displays in southern Arizona. This beautiful natural area is about three hours from Phoenix (via AZ-85) or Tucson (AZ-86). Note: This park is located along the Mexican border and has long been a pathway for illegal entry. While the situation has improved, the park is no long completely pristine or safe. There is restricted access to the backcountry. Contact the ranger for more information. Seven Springs Recreation Area. Follow the main trail (#4) into Cave Creek Canyon. As the elevation drops, the heavily wooded riparian area becomes a scenic desert canyon. Here the steep hillsides were covered with poppies in 2001. Located in the Tonto National Forest. Head north on Cave Creek Road which becomes Forest Road 24 after the Bartlett Lake turnoff. The dirt road is passable to all vehicles when dry. Arizona State Parks - Visit the Arizona State Parks's website for more information on fees, camping, trails, and special events. Alamo Lake State Park Expect to see lupines, brittlebush, and poppies at this park. About 2 1/2 hours drive northwest of central Phoenix. The park is located 34 miles north of Wenden off US-60. Boyce Thompson Arboretum State Park - One of the oldest and largest botanical facilities in the southwest, Boyce Thompson is located about 30 miles east of Apache Junction on US-60. A 1.5-mile main loop trail covers the park with many side trails to specialty gardens and other areas. The highlight is spectacular Queen Creek Canyon. Lots of wildflower viewing opportunities here and in nearby areas. The season is a bit later than in metro Phoenix due to the higher elevation. 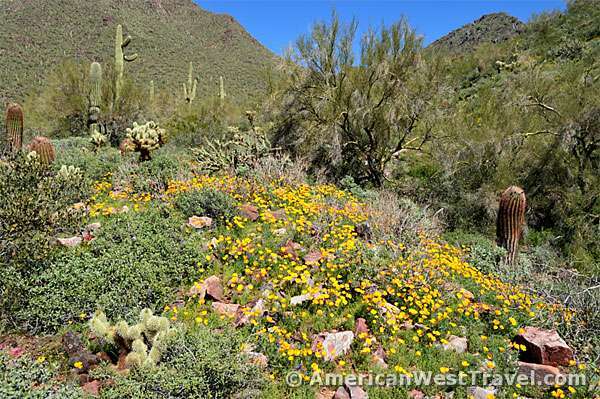 For a comprehensive and frequently updated list of wildflower reports, visit the Boyce Thompson Arboretum's website or call the Arboretum's recorded information phone line at (520) 689-2811. Catalina State Park. Located at the foot of the Santa Catalina Mountains, this well-watered park offers a very lush desert environment with good wildflower possibilities. In 2001, we found excellent displays on the Romero Canyon Trail, especially in upper Montrose Canyon. The park entrance is on the Oracle Highway, north of Tucson. Picacho Peak State Park Mexican Gold poppies and other wild flowers are visible along the road and ditches inside the park. The park is located on I-10 halfway between Phoenix and Tucson at exit 219. Maricopa County Parks - Visit the Maricopa County Parks's website for more information on fees, camping, trails, and special events. Cave Creek Regional Park. The 4.8 mile Go-John trail passes through a variety of terrains - hillsides, washes, valleys - with opportunities to see different kinds of flowers on display. Located off of the Carefree Highway (AZ-74) at 32nd Street. Usery Mountain Regional Park. The 7-mile Pass Mountain Trail offered lots of wildflower variety as well as excellent views of the Superstition Mountains. The best displays were on the steep hillsides. Located in east Mesa. Take the Ellsworth Road exit north from the Superstition Freeway. White Tank Mountain Regional Park. The Goat Camp and Ford Canyon trails provide excellent vistas of poppies, lupines, and other wildflowers. The park is located at 13025 N. White Tank Mountain, Waddell, AZ. From Phoenix, take the Loop 101 to Olive Avenue and drive west for 13.6 miles to the park entrance. Scottsdale's McDowell Sonoran Preserve - Visit the McDowell Sonoran Conservancy website for more information on trails and special events. Gateway Access Area. Most popular and convenient access area near intersection of Bell Road and Thompson Peak Parkway. Gateway Loop (4 miles) is popular and easy with varying scenery. Best wildflower displays in 2013 were on Bell Pass Trail east of intersection with Gateway Loop. City of Phoenix Desert Parks and Preserves - Visit the City of Phoenix Parks and Recreation's website for more information on trails and special events. Phoenix Mountain/Dreamy Draw Area. There are numerous units throughout the city. Most people are aware of South Mountain Park and Piestawa Peak. However check the area east of Dreamy Draw Park. There is a parking lot and trailheads where 40th Street dead-ends about a mile south of Shea. Arizona Sonora Desert Museum. Adjacent to Saguaro National Park West, the museum is located in a saguaro forest and has numerous botanical displays that are manually irrigated. Easy trails make this facility readily accessible to everyone as well. Phoenix Desert Botanical Garden - The garden is located in Papago Park next to the zoo. You are assured of seeing flowers here because the garden is manually irrigated. Easy paved trails make the facility readily accessible to everyone. For spring wildflower reports during the months of March and April, visit the Phoenix Desert Botanical Garden's website or call the Plant Questions Hotline at (480) 941-1225. Pinal Pioneer Parkway. Part of the "scenic" route (AZ-79) between Tucson and Phoenix, the section between Oracle and Florence passes through a very lush desert upland area rich in large cacti and shrubs. We observed a variety of wildflowers in this area. Also, look for beautiful flowering cacti later in the season. US-60 east from Apache Junction to Boyce Thompson Arboretum. You are likely to see Mexican goldpoppies, lupine, and phacelia at Florence Junction near mile marker 209. Fairy duster, desert marigold, globe marigold, and brittlebush become more prominent as you ascend up through Gonzales Pass at mile marker 218-219. US-60 west from Globe/Miami to Boyce Thompson Arboretum. Look for the waterfall near mile marker 229 and just east of the Queen Creek tunnel. Park at the roadside pullout just below and west of the waterfall. You can hike up to the waterfall and be on the lookout for deer vetch, firecracker penstemon, pepper grass, rhyolite bush, and wild heliotrope. 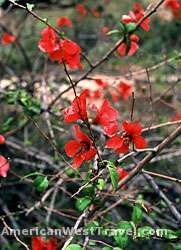 Many people like to identify the different varieties of wildflowers. An excellent introduction to wildflowers of the Southwest can be found in "Wildflowers of the Desert Southwest" by author Meg Quinn.